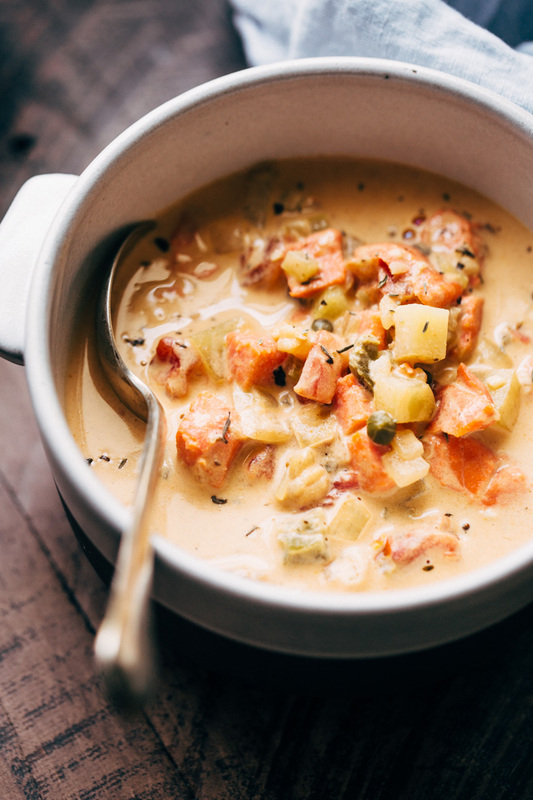 A smoked salmon chowder loaded with tender potatoes, cream cheese for creaminess, and capers for a little added zing! This tastes just like the stuff they serve at the Seattle Pike Place Market! With a large hunk of crispy baguette. This is rainy weather, smooth jazz, Sundays-couldn’t-be-more-perfect kinda food. 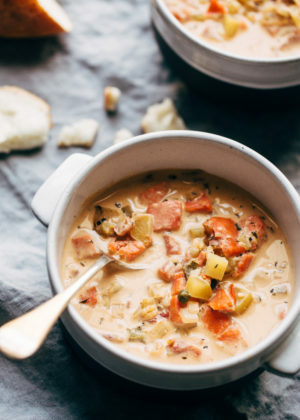 Smoked salmon chowder with – you guessed it – smoked salmon, tender potatoes, itty bitty capers to give you that zing, it pairs so beautifully with fish and tons of liquid gold, creamy soup. 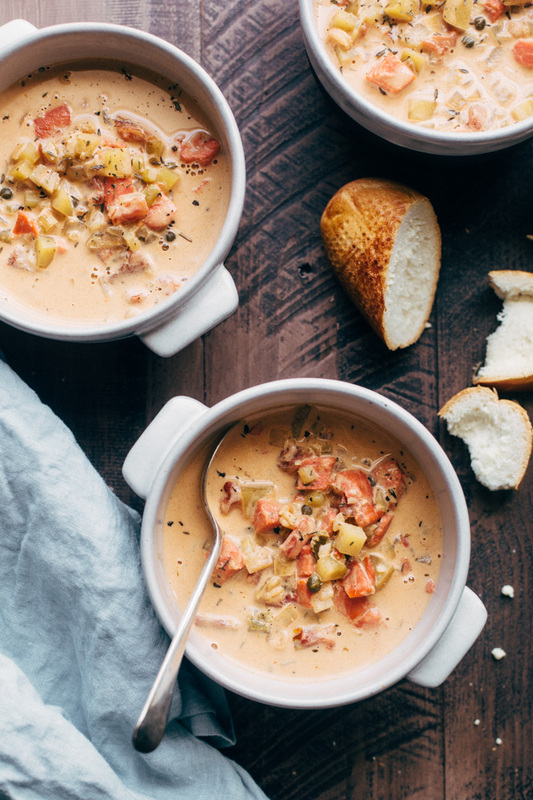 But friends, there’s just one thing this smoked salmon chowder doesn’t have. Flour. As in, i’m from that school of thought where it’s illegal to put flour in your chowder. 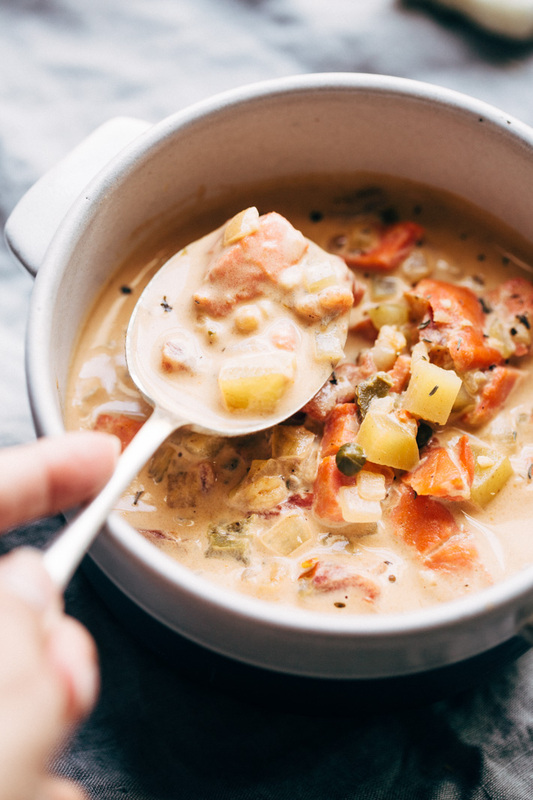 Chowder that’s thickened naturally with the starch from potatoes means all my GF friends can enjoy this one with us too! After our 10 day west coast trip  where we ate our hearts out in three different states, all I can think about is those teeny tiny donuts from the Pike Place Market and recreating all the fine food offerings of the west coast. Can we say sushi burrito, a healing bowl of red miso with soba noodles, and my personal favorite, a Thai burrito with fried rice and chicken all wrapped up in a large tortilla, served with the most addicting sweet and tangy dipping sauce. Straight out of food heaven, I tell ya. Smoked salmon chowder just happened to be one of the first things we consumed and added to the list of things to make over and over again for at least the next 10 years of our lives or so. The thing about this soup is that it gets you from bite #1. The creaminess followed by a hint of salt, smoky salmon then comes the richness, the golden nuggets of softened potatoes, to finish it off, briny capers and basil. Its one of those sensational meals that vary from bite to bite. I love those kinda meals. What i’m basically trying to say is you NEED TO MAKE IT. And you know what? I know that chowders aren’t the healthiest things we’re going to put in our bodies. But that’s okay, its one of those sometimes food that we consume then proceed to think about while we’re on squat 1000 at the gym. No regrets either because every single bite of this smoked salmon goodness was worth it. 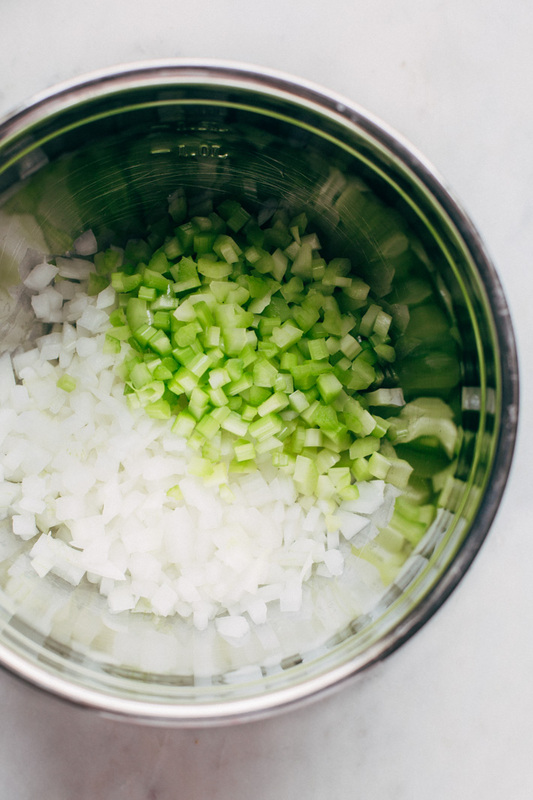 This chowder like most, starts with onions and celery. I didn’t use carrots in my chowder because I didn’t spot any in my bowl of soup from PPC. This is totally your call though, it could go either way. Next comes lots, and I do mean LOTS because when was the last time you saw a recipe on LSJ that didn’t have a ton of garlic? Answer: probably never. We’re major garlic people here. You’ll also need a whole pound of peeled and diced potatoes. I used yukon golds because that’s what I had on hand but russets will work well too. 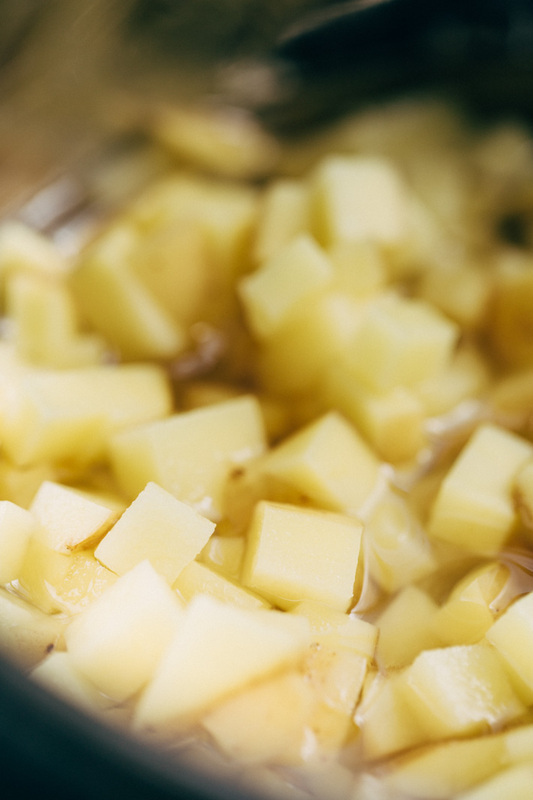 They’ll break down a little and soak up more cooking liquid than yukon golds will so you may need a little extra broth for them. The key to good homemade chowder is to allow the potatoes to really cook until fork tender. The starch from the potatoes will naturally thicken the chowder so no need to grab extra butter or flour for a roux. Pro tip #1: if you can, make this soup up to one day in advance before you serve it. All my chowder research has lead me to believe that the best chowder experience is always the day after you make it. I gave this a try to make sure this indeed was the case. Yes! 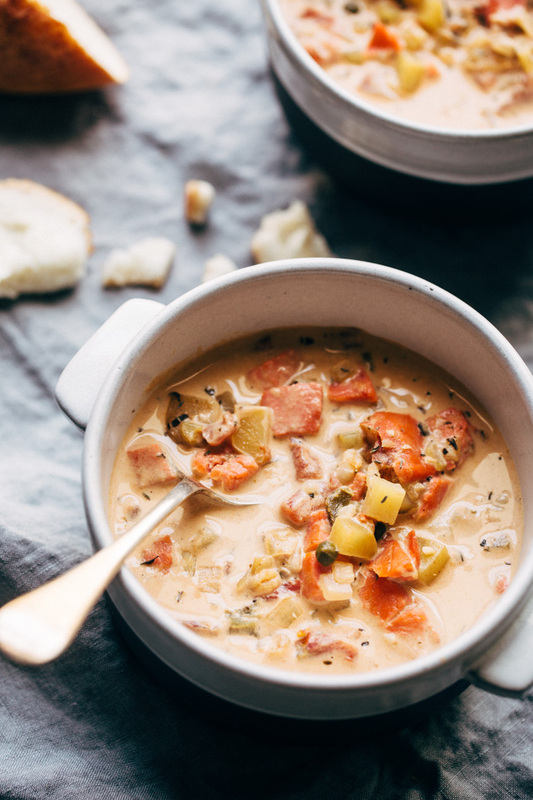 This smoked salmon chowder tasted even better as the flavors all got together and mingled. The potatoes allowed the chowder to thicken a bit more – something that wouldn’t have happened had we served this immediately after making. Pro tip #2: use less sodium seasoning . 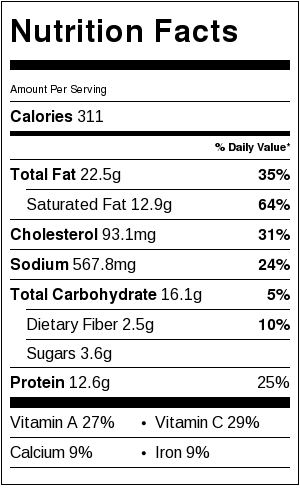 You’ll need a whole 4 teaspoons of this stuff so make sure to use the stuff with less sodium. Pro tip #3: Use shrimp, lobsters, fish, or seafood stock if possible. 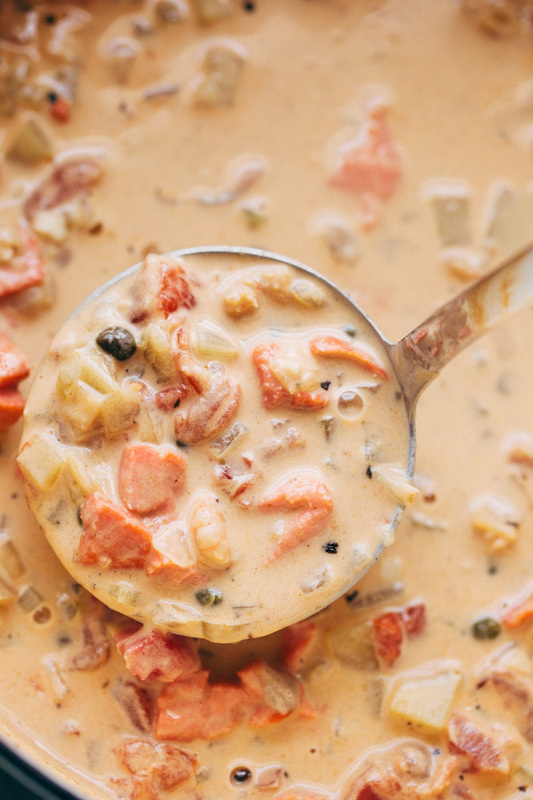 The seasonings we’re using in the chowder pair beautifully with these kind of stocks. If you can’t find them or don’t want to run out for them, use chicken stock. Whatever you do, don’t use water. Whenever you plan to put this salmon chowder on the menu (my hope is that you’ll make it today and serve it tomorrow), keep the sides simple, a garden salad and a hunk of fresh, chewy bread  is all this really needs. You know, V-day is right around the corner, and I bet this would make a great little starter or main course. Don’t say I didn’t warn you: this meal may induce lunch envy from coworkers as the smoked salmon chowder smell wafts through the workplace. I say pack extra crackers and or bread and go full throttle at lunch. Are you looking forward to bagged lunches this week? Heat the butter in a large soup pot or dutch oven over medium high heat. Add the onions and celery and cook, stirring, until translucent and softened about 5-6 minutes. Add the garlic and the potatoes. Crush the fennel seeds between your fingers and add them in. Add the bay leaves, dried basil, diced tomatoes, 2 ½ cups of stock, capers and brine. Let the soup gain a rolling simmer, cover and let cook for 8-15 minutes or until the potatoes cook all the way through. The timing may vary as this depends on how small you diced your potatoes. When the potatoes are fork tender, remove the lid, kick the heat up to medium and stir in the tomato paste, cream cheese, and old bay seasoning. Allow the cream cheese to melt into the soup. Add the heavy cream and reduce the heat to low, allow the chowder to gently warm through until a light simmer develops. Add the shrimp and smoked salmon and let everything just heat through. Serve the chowder immediately or as I recommend, chill the chowder for several hours before serving. This will allow the flavors to develop further and will help thicken the chowder further. Rewarm before serving. Use additional stock to thin the chowder to preference. Season with additional salt as desired.